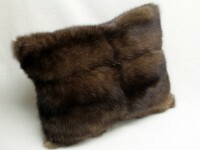 Soft rex rabbit fur pillow in brown with a soft black woolen backlining. For more fur pillows visit our online Shop Master Furrier Lars Paustian. Add a touch of grace to your home decor with a beautiful coyote fur pillow.